First of all, welcome to everyone who is being referred to this blog by our, soon to be, riding partners, Keith, Dave, Jim and Michael. We are all meeting in San Diego on January 10, where we will continue together to South America. 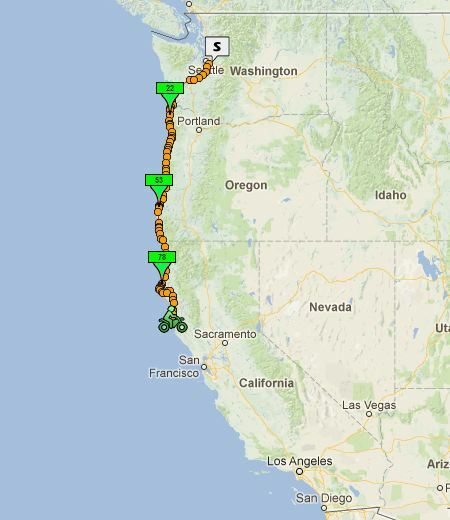 Deby and I (Donn) left Seattle a few days ago and are gradually making our way down the coast. Once we are all together I’ll be sure to mention them often in my report and convey their status from my point of view. But, for now, it’s just me and Deby making our way south. I received an e-mail today from Tom Mehren from Sound Rider, he has copies of the book MotoRaid for sale on his website HERE. Motoraid documents the story of Keith Thye and David Yaden’s trip to Pucon Chile in 1963 that we are recreating 50 years later. 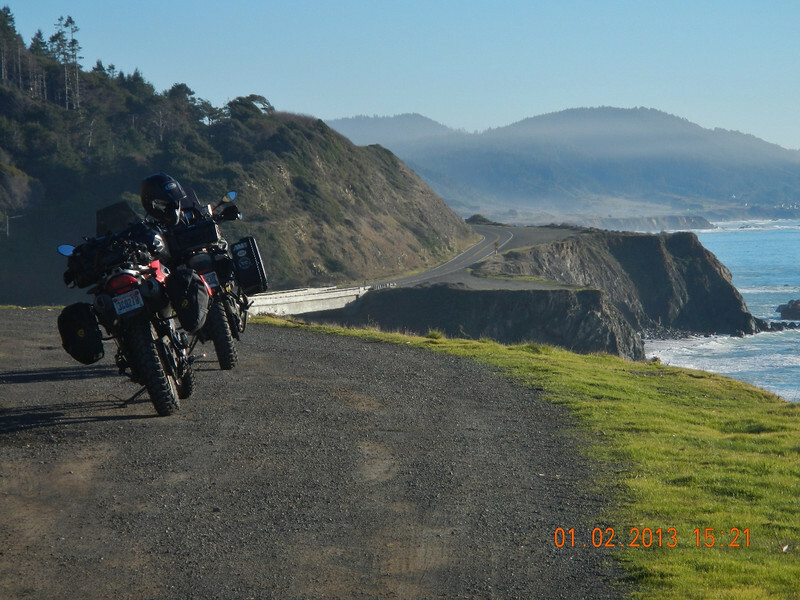 Ok, not many miles, only 168 but we had a fantastic day riding on some of the best twisty roads in the United States. Plus, it’s hard to get a long day of riding in during January when it’s getting dark by 4:30 PM and we can’t start too early because of all the frost and ice on the road. Today, we were riding by 10:00, the starting temperature was 38 degrees F. The cool overnight temperatures had me on high alert for frost and ice on the road. 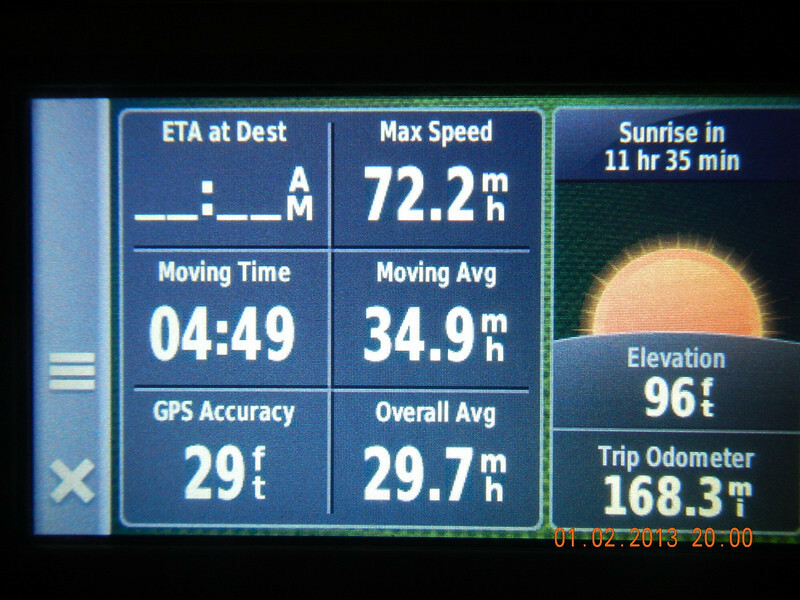 Sure enough, we were treated to plenty of both which really slowed down our speed. 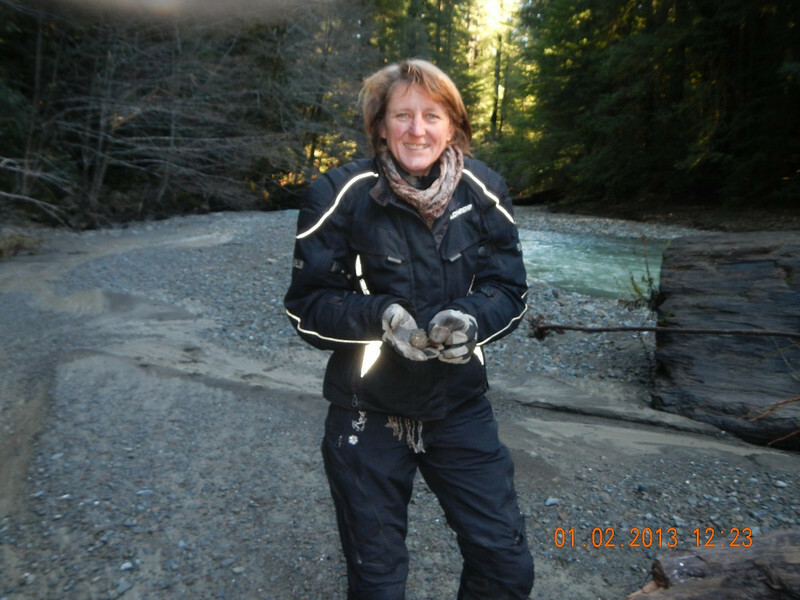 A crisp morning awaited us as we readied the bikes, Deby’s saddlebag and our bike covers were covered with ice. 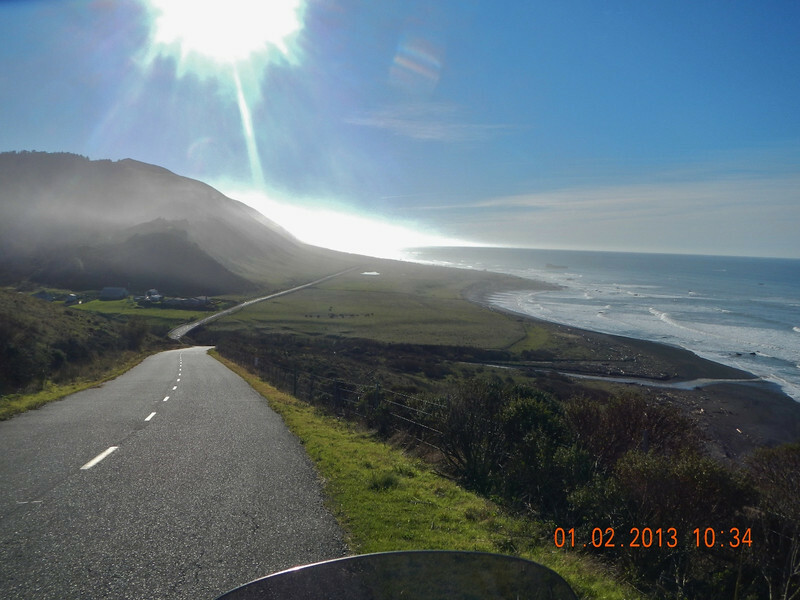 We stared out west from Ferndale on Mattole Road in search of the “Lost Coast”, the road was twisty and fun as it snaked it’s way west to the Pacific Ocean. Check out the link in my last post about this road, fun. 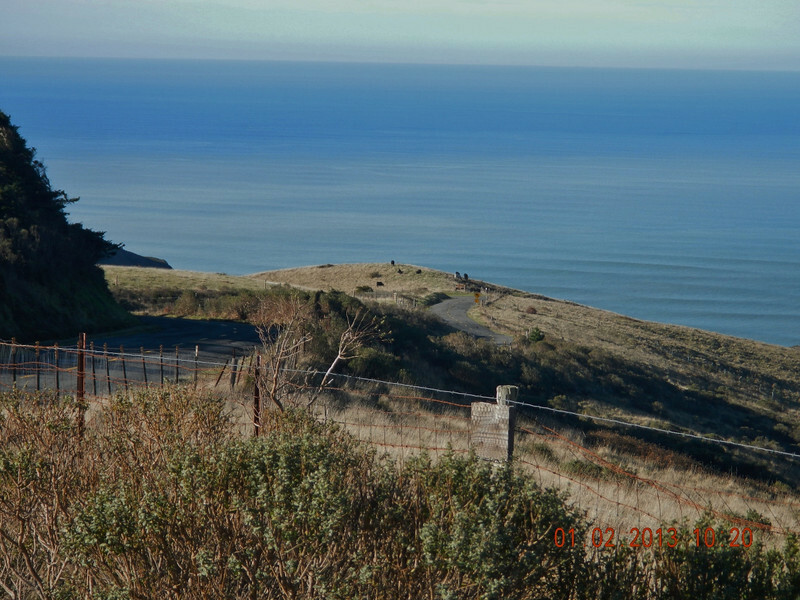 It wasn’t long before the ocean came into view, check out the road winding down to the beach. 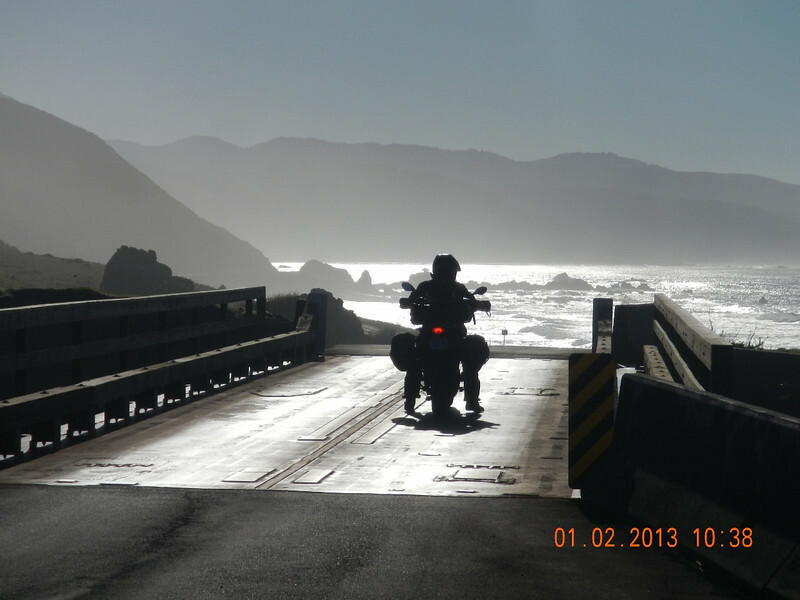 Deby on a nice little bridge crossing, it’s always good riding into the sun. 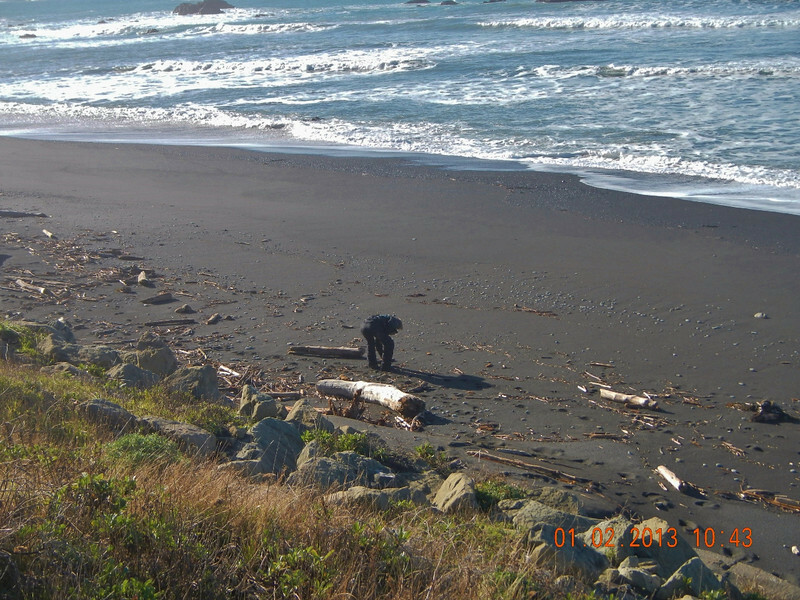 We couldn’t resist stopping at an incredible black sand beach where Deby did some rock collecting (ummm, let’s just say it’s a habit). 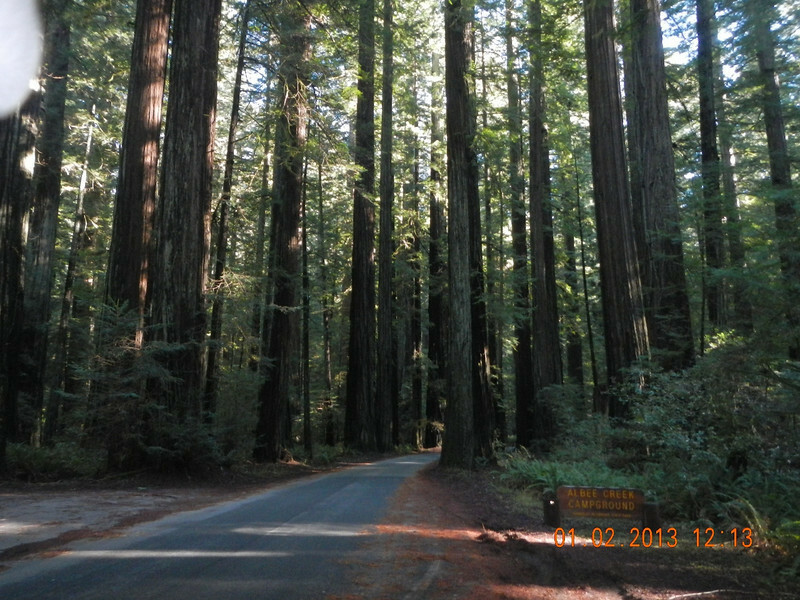 Eventually the road crosses 101 where it ends at the start of the Avenue of the Giants. Click on the link to read more about it. It’s a famous road and we were lucky to have it mostly to ourselves on this cool January day. The tall trees kept the sun out and the cool air in so we were back in the 30s watching for frost on the road the whole way. 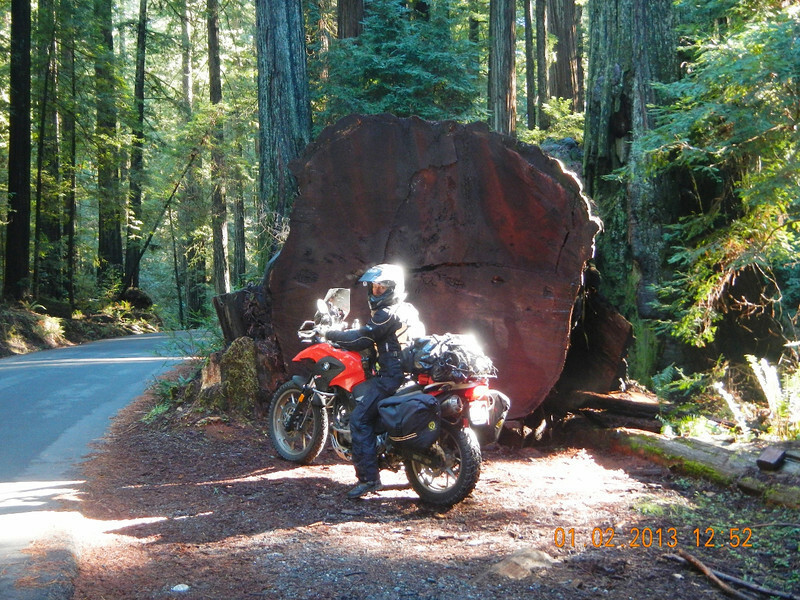 A short way after Avenue of the Giants ends 101 connects with highway 1 towards the coast. 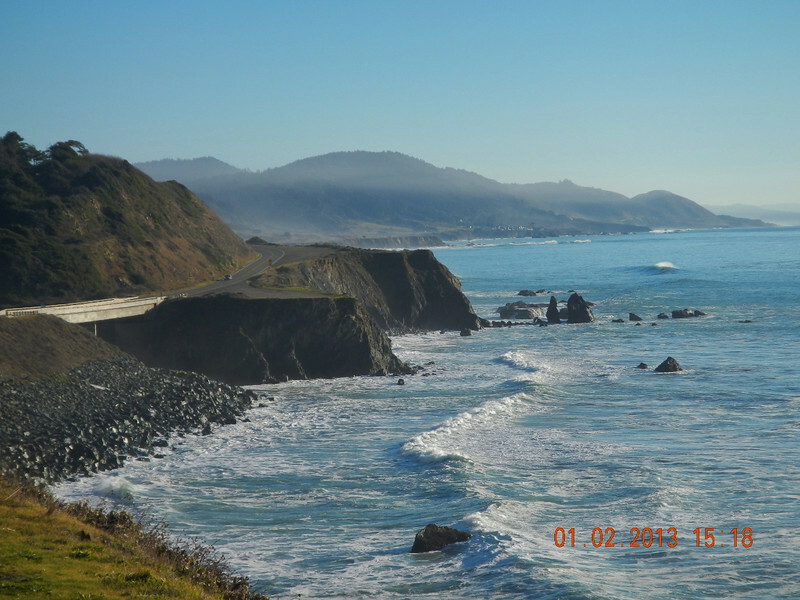 Highway 1 was twisty and narrow with very few cars as it climbed a small range of hills before dropping down to the coast. The temperature in the trees again, stayed in the 30’s and we were frequently slowing down for frost and ice on the road. 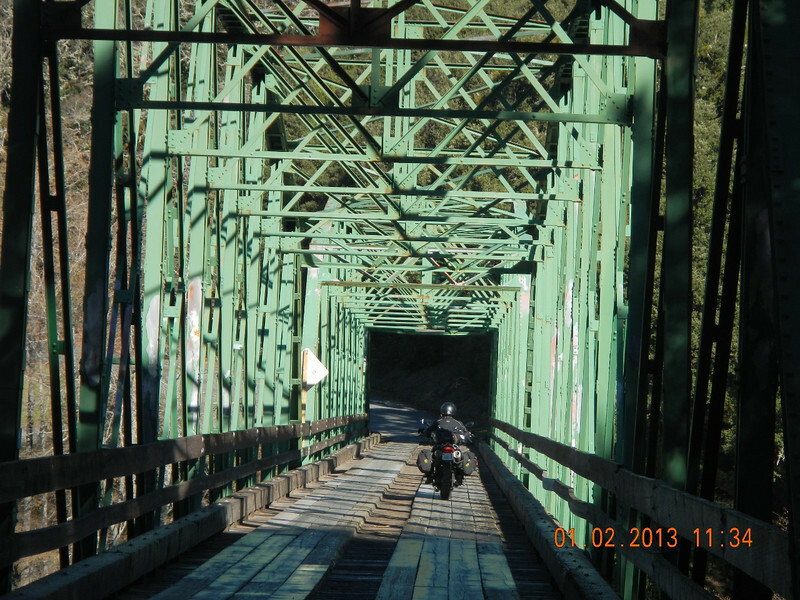 We were glad to get out into the open where the sun warmed the road and the air temperature into the low 50’s. 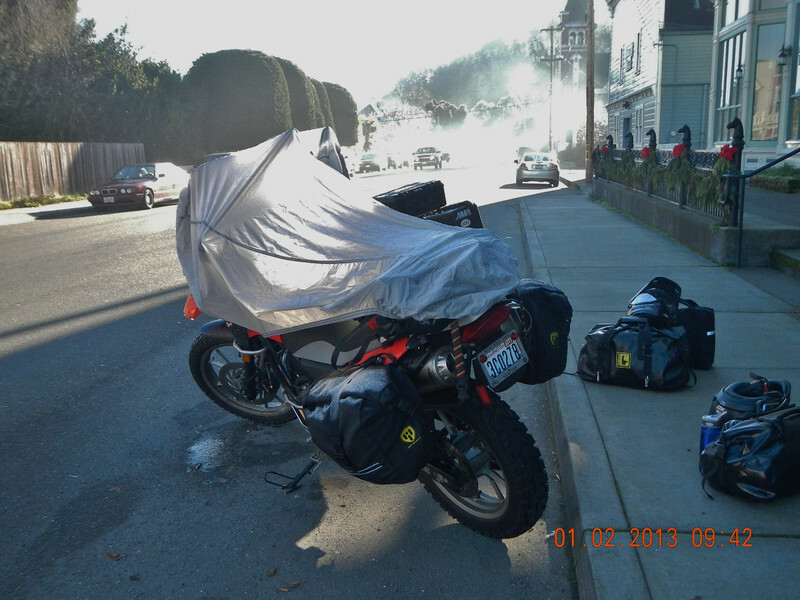 We rode all day without filling our tanks and arrived in Fort Bragg with both bikes on reserve. It was starting to get dark so we checked out a few hotels and found out the North Coast, as they call it, is a relatively expensive place to stay. We ended up at a Holiday Inn a few blocks off the beach. If I did everything correctly you should be able to click on the image to see the actual plot. Love the rocks . love the roads . love the water . 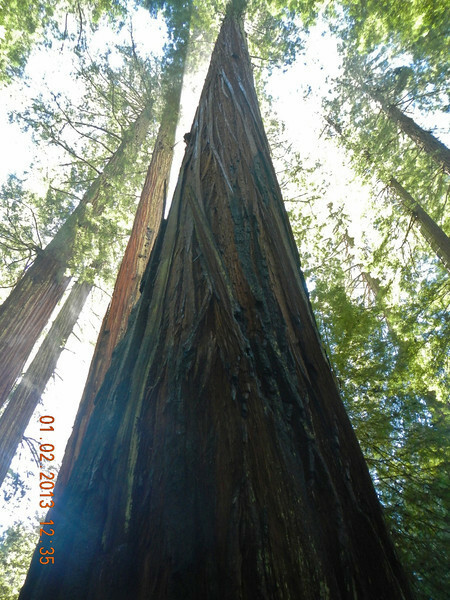 Love the trees . I have got to get out there !! Loving the progress reports and pics. What an incredible experience , and you’ve only just begun! Looking forward to all the future blogs from you. Really enjoying following your progress, Donn & Deby. Thanks for letting us have a vicarious experience along with you! p.s. 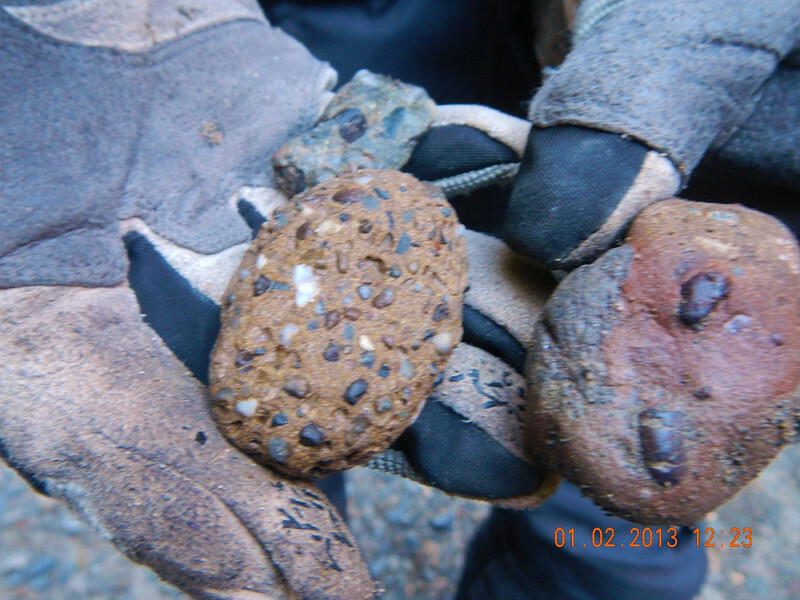 I completely understand the rock collecting! Flat Rate boxes are a great way to ship them home.